NOTE: Printed wristbands are more susceptible to fading than debossed or embossed. Do not expose to lotions, chlorine, and other chemicals. Printed, detailed lettering and art displays your fonts and logs in an optimal way. 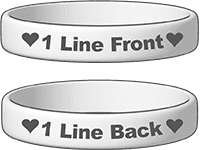 Because the lettering and art is printed with silicone ink, it stretches with the wristband, so it won't crack or fall off. We use the highest quality mixtures of industrial-grade silicone to make sure you're getting the toughest, most awesome bands ever. Silicone is stronger and longer-lasting than rubber, and Reminderband conducts ongoing tests and research to ensure our bands are the best on the market. 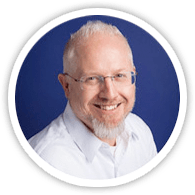 A huge printing benefit is we can print in high detail. The art you see in our example could not be debossed as clearly as it can be printed. Value. 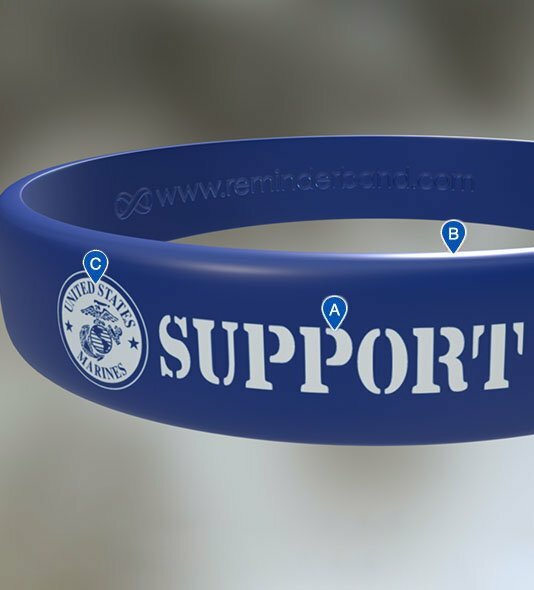 This is the most inexpensive way to get printed color on your wristband. Save as much as 35 cents per wristband over the Classic. Since there is no engraving, we pass that savings on to you. Detail. 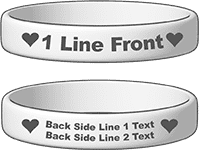 If your logo or art or font is highly detailed, your best option is our Printed Wristband. You can even add additional colors if desired for an additional cost. Time. Printed Wristbands are easier to make than debossed wristbands with colorfill since colorfill requires high manual labor to fill the lettered debossing with silicone and then a baking process. Because of the reduced production time, we can get your wristbands to you a couple days earlier.